'By their books you shall know them'. If the shelves of someone's study are adorned by sixteen white and green volumes, The Works of John Owen, they are likely to be 'Reformed' types. The kind that attend Banner of Truth Ministers' Conferences, and the like. Whether those hefty tomes have been plucked from the shelf and read is another thing. For John Owen (1616-83) is a difficult man to read. Only a few brave souls have ventured beyond Volumes 1 and 2, possibly 6 at a stretch. But the set serves as an identity marker. Merely to posses it is enough. Perhaps the proud owners hope that the wonders of Puritan divinity will infiltrate their souls by osmosis? For those who wish to make more of a determined effort actually to read Owen, the green and white volumes are both a help and a hindrance. We must salute the efforts of W. H. Goold in gathering Owen's writings together and the Banner of Truth Trust in reprinting them, but Goold's orangising system was a little haphazard. He tended to group Owen's writings thematically rather than chronologically. It is difficult, therefore, to trace developments in his thinking over time. Oddly, Volumes 1 and 16 include some of the divine's posthumously published final works, Meditations and Discourses on the Glory of Christ (1684) and The True Nature of a Gospel Church (1689). That is one of the reasons why Crawford Gribben's biography is an indispensable guide for serious readers of Owen. He sets our man's literary output against the backdrop of his life and times so we can see the political and religious contexts in which he operated. Situating Owen's writings in this way helps to serve as a reminder that he was no ivory tower theologian. His pen was often directed to responding to some of the pressing controversies of the day such as Arminianism, Socinanism, and, of course, Roman Catholicism. In addition, Owen sought to explain and defend his Independent churchmanship against both Presbyterian and Anglican antagonists. While we would hardly call him a social libertarian by today's standards, the Puritan argued for religious tolerance. At least as far as orthodox Protestants were concerned, whatever their ecclesiastical stamp. Owen is a difficult man to read. While the details of his public career are known, his inner thoughts are hard to fathom. Owen rarely made autobiographical remarks in his writings. He left behind no journal to which he bared his soul. You will search his works in vain for references to how Owen felt on the death of his first wife, or the loss of all ten of his children. Notwithstanding these constraints, Gribben manages to piece together a life of Owen that helps us get under the skin of the public figure. Owen's career began as a pastor of small congregations in rural Essex. He accompanied Oliver Cromwell on his Irish campaign. Owen was often asked to preach to Parliament, including the day after the execution of Charles I. He became Vice Chancellor of Oxford University, defending that great place of learning against radicals who had little time for the world of letters. I hadn't realised before that the English philosopher John Locke studied under Owen at Oxford. With the return of Charles II Owen, fell out of favour. He was removed from Oxford and returned to pastoral ministry, serving Independent congregations until the end of his life. The Restoration brought new challenges for Owen. His writings had to be published anonymously, with different emphases for different audiences. He warily sought to defend his Independent convictions against those who labelled him a dangerous sectarian and Republican rebel. Meanwhile, the Puritan preacher who criticised Cromwell's Protectorate for its love of worldly grandeur now celebrated Charles II as a paragon of Protestant piety. He knew that the King rather than parliament would be more likely to extend toleration to nonconformists. The work is a salutary study of what happens when the godly get what they so often wish for; political power. Puritanism could not be imposed on the population of the British Isles by parliamentary decree, or through Cromwell serving as Lord Protector with the support of the army. England was not the New Jerusalem after all. Parliamentary victories at Marson Moor and Naseby did not mean, as Owen and others argued, that political Puritanism had divine sanction. Christians function best as a counter-culture within society, rather than as the Establishment using its power to foist the highest standards of godliness upon a largely unregenerate nation. We are meant to function as 'salt' that preserves meat from decay, not fillet steak. There is no glory, no peace, no joy, no satisfaction, such a foretaste in this world, to be compared with what we receive by that weak and imperfect view which we have of the glory of Christ by faith; yea, all the joys of the world are a thing of nought in comparison of what we so receive. (Works Volume 1, p. 415). As Gribben suggests in his Conclusion, while Owen's public life may have been characherised by a series of reversals, his published Works would afford him a kind of victory in later generations. Evangelicals turned to his writings for their theological depth, practical piety and experimental warmth. George Whitefield commended Owen to his fellow-Methodists in the 18th Century. C. H Spurgeon ensured he had an audience among Calvinistic Baptists in the Victorian era. 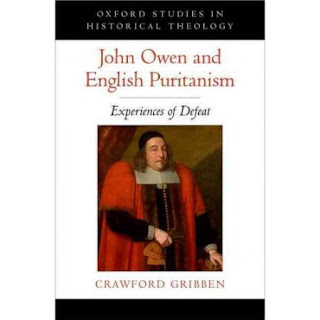 Owen's writings played an important role in the resurgence of Reformed theology associated with the ministries of D. Martyn Lloyd-Jones and J. I. Packer in the 20th Century. Renewed attention is being given to Owen in the contemporary globe-spanning Reformed movement. If his Works were read by those who posses them beyond the familiar Volumes 1, 2 & 6, that would save John Owen from yet another 'experience of defeat'. Yes, he is a difficult man to read, but for those who persevere through the thickets of complex sentences and strange neologisms, there is theological gold in them there white and green tomes.